Your Grandad met Dior you know! A few pics from the family archive today. All these feature my wonderful Nanna. A woman who simply tells the BEST stories. On Thursday we were just chatting and I mentioned that I was reading a book about Dior. Nanna piped up “ your Grandad met him you know” I was like, Nanna are you sure? Shy, world hating, people-phobic Grandad Hugh met Dior? “Yes. He came over to London with his assistant and your Grandad met him, he drove him around London for his boss”. Still I am a little bit shocked by this! It must have been when my Grandad was working for the tailor Hector Powe. His boss there was someone who knew everyone and it appears that Christian Dior himself was one of these people! One of these pics proves a very important point too, about the bikini. 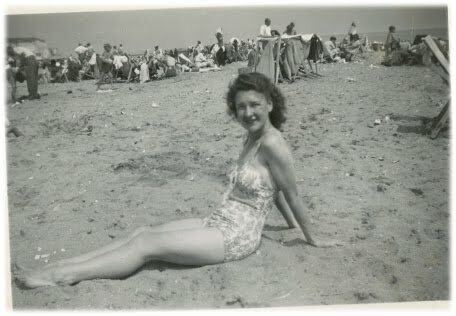 This picture was taken in 1946 and one of the ladies (my Great Aunt) is wearing a bikini. 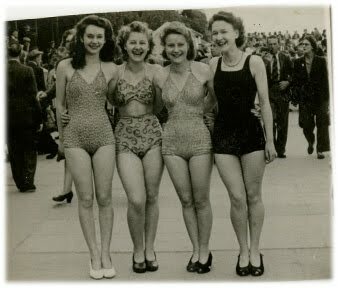 Proving contrary to popular belief the bikini was a key fashion piece for the beach in the 40’s, even if it wasn’t referred to by that name! i love how they are all just standing in bikini's infront of what appears to be a crowd full of business men. 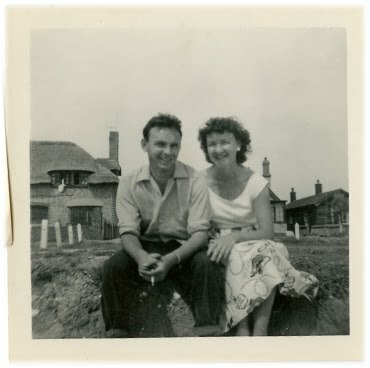 Well…My Nan's never been a shy one! ha ha.